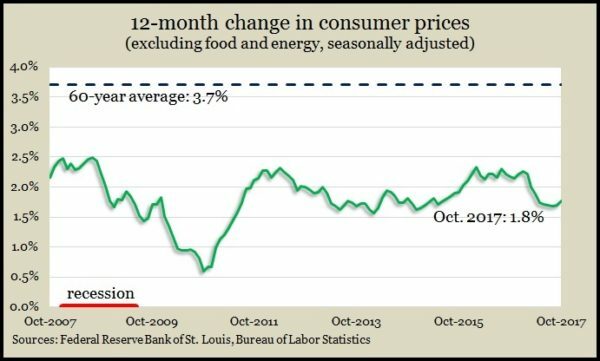 Inflation on the wholesale level rose 0.4% in October, the same pace as September. Excluding volatile food and energy costs, the Producer Price Index gained 0.2%, the same as four of the last five months, according to the Bureau of Labor Statistics. Year-to-year comparisons showed costs starting to rise on the wholesale level, with the overall index increasing 2.8% since October 2016, the highest since February 2012. The core wholesale inflation rate was 2.3%, the highest since August 2014. The broadest measure of inflation also increased in October. The Consumer Price Index rose 0.1%, highlighted by a 0.3% gain in shelter costs and a 2.3% drop in gasoline prices following a spike at the pump following the Gulf Coast hurricanes. Excluding food and energy, the CPI rose 0.2%, the Bureau of Labor Statistics reported. The broader index grew 2% in the last year, down from 2.2% in September and the first decline in four months. Core prices rose 1.8% in the last 12 months – up from five months at 1.7% but still below the Federal Reserve’s longstanding target of 2%. A key measure of consumer spending – retail sales – grew more than analysts expected in October following hurricane-inflated boosts to vehicle and gas sales in September. The Commerce Department said that 10 of 13 retail categories had higher sales in October. The outliers included building centers, gas stations and online retailers. Year-to-year, retail sales rose 4.6%, which is above the 20-year average of 4.4%. Consumer spending accounts for more than two-thirds of U.S. economic activity. Business inventories were unchanged in September, lagging a 1.4% increase in sales, according to a Commerce Department report. As a result, the inventories-to-sales ratio declined to its lowest level in two years, near where it was at the end of the recession. The lower ratio suggests businesses are trying to more closely align supply with demand. Year-to-year, inventories rose 3.5% while sales rose 6.4%. The Federal Reserve reported that industrial production picked up in October, helped in part by recovery efforts from the hurricanes. Output rose 0.9% on top of higher estimates for the three previous months. Excluding impacts from the hurricanes, production rose 0.3% in October, and manufacturing was up 0.2%. Capacity utilization grew to 77.7%, the third increase in a row. The long-term average of 79.9%, above which economists begin to worry about inflation pressure, hasn’t been reached in three years. The moving four-week average for initial unemployment claims rose for the first time in seven weeks, a week following its lowest level since March 1973. The Labor Department indicator is 33% below the 50-year average, which suggests employers continue to be reluctant to let workers go. That should boost hiring and wages, which should fuel more consumer spending. The Commerce Department reported gains in both housing starts and building permits in October. Starts rose 13.7% to an annual pace of nearly 1.3 million units, which was down 2.9% from the year-earlier rate. Single-family houses, which make up two-thirds of new houses, were outpaced by multi-family units, according to the report. Building permits suggested further construction, jumping to their highest annual rate since January. Of greater significance, the number of houses completed reached the highest pace since February 2008, which could help address concerns that there has been a shortage of houses for sale.